Mid-Autumn Moon Cake Festival has just passed and it reminded me the photos that I took during Chinese New Year 2011 . I hereby presenting you the rabbit of the year - YiChing. Noticed I took more photos of YiChing, and that's why less photo for Cayenne Lim and Alicia Phang *paiseh*. Maybe because they were modeling for Feeq and Jason? I can't remember. Nevermind, I will label all photos below with number and do tell me which top 3 are your favourite shots okay? #1 If it is a fashion shot, people want model to smile less. Is it true? #13 My personal favourite. It looks fun! #30 T.T for the mosquito bites? Last photo of the photoshoot! 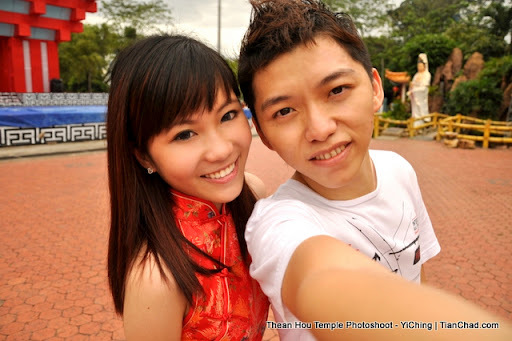 Thanks YiChing for being one of the models in my first ever photoshoot with CNY theme @ Thean Hou Temple with Feeq and Jason! Remember tell me which top 3 are your favourite shots okay? Feel free to comment below! You can check out my other photos from Alicia and Cayenne by checking out this Thean Hou Temple Series.